This easy dinner is so delicious that you won’t believe that you can make it in just minutes using only one dish! 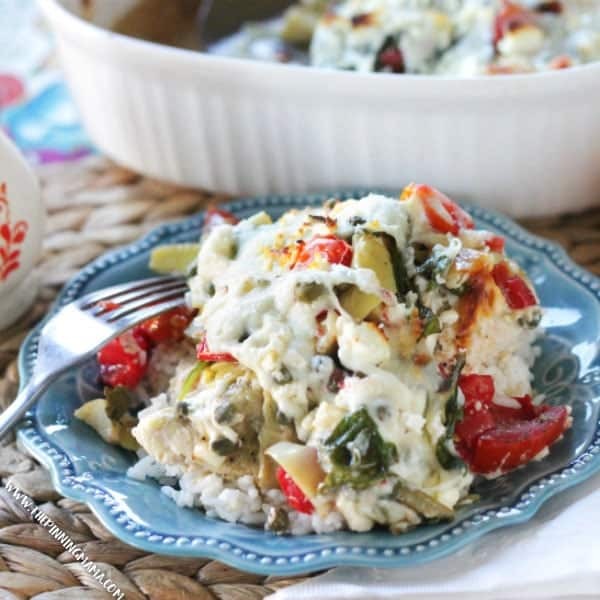 The Mediterranean Chicken Bake recipe has all the flavors you love like tomatoes, spinach, artichokes, feta, lemon and greek seasoning baked right on top of wholesome chicken breast. 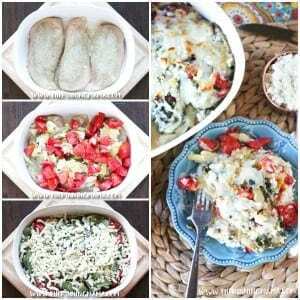 This is equally perfect for a busy weeknight or entertaining friends! There are so many things we have loved about living in Utah. We love our friendly neighborhood, walking out the door to views that make you feel like you actually snuck into a resort and have been hiding away waiting for them to tell you that you have to pay much more to access all of the beauty, and new experiences, like gardening. I have always considered myself to have quite the brown thumb. Very few plants that enter our home have a long, happy and fulfilling life. But after seeing all of my neighbors here with gardens overflowing with gorgeous plants yielding fresh produce daily, I decided this summer that it was now or never! So now it was and I spent far more than I might have actually spent buying produce planting the garden of a lifetime! I asked my friends what to plant and they said zucchini! You can’t kill zucchini. Well I did. 3 times. But I did manage to keep a few tomato plants alive and well enough to give me a tub full of tomatoes this past August. All the fresh produce makes me excited to cook things that show them off so I combined them with some of my favorites, fresh spinach, tangy artichokes, lemon juice, capers, greek seasoning and topped it all with delicious mozzarella and feta cheeses to make what came out of the oven as one of my new favorite dinners! If you love easy and wholesome weeknight dinners, then make sure to check out all of my Easy Chicken Bake Dinner Recipes here! I have accumulated quite the collection to make weeknights easy and delicious! Another one of my easy favorites is this Greek Chicken. Click here to grab a quick & easy recipe card, or read below for my step by step instructions along with my thoughts and notes on making this recipe. 1 Tbsp Cavendar’s Greek Seasoning- This comes in a yellow cardboard container with a sprinkle top and can be found in the seasoning section of most major grocers or mega stores. 1 Can Artichoke Hearts, drained and chopped – It doesn’t matter whether they are marinated or not since we drain them, so just use whichever you prefer! 2 oz Jarred Capers, drained – These are optional so you can leave them out if you don’t like them. 2 oz is about half a normal sized jar. Lay the chicken side by side in the bottom of a large baking dish, then sprinkle the greek seasoning evenly over the top of each piece of chicken.By sprinkling the seasoning over the chicken directly, it will give the chicken itself much more flavor. If you sprinkle it over the top of all the veggies, you won’t get nearly as much flavor in the chicken. I found one tablespoon to be the perfect amount of seasoning for 3-4 chicken breasts, but if you like more or less, adapt the quantity to taste. Layer on the chopped artichoke hearts, tomatoes, and spinach and then sprinkle the capers, lemon juice and olive oil over it.Feel free to take a little creative license here. I created this using items that I knew we needed to use from our pantry and garden, but if there are other veggies you have on hand you can add or substitute those as well. Just make sure they are similar in texture for a similar cook time. For example, you would be fine adding sweet peppers but you wouldn’t want to add potatoes since they take too long to cook! Also, I know not everyone loves capers, so if you are one of those people, then feel free to leave them out. There are not enough to be overwhelming in this dish and with them included I love the tiny bit of bite they add here and there. 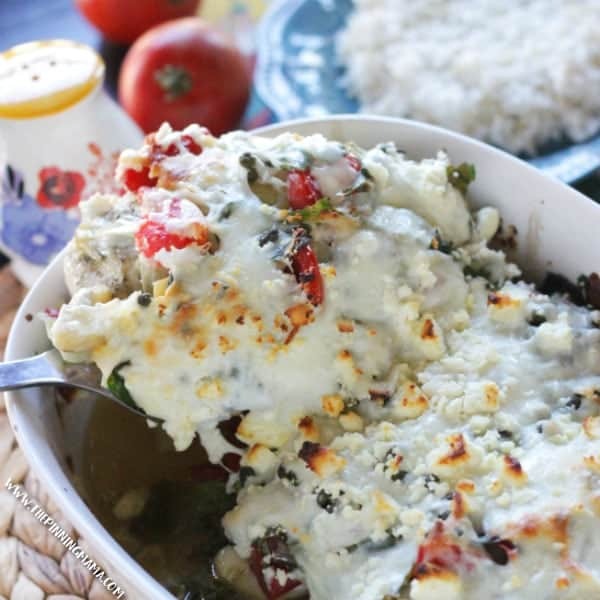 Top the dish with the mozzarella and feta cheeses and place on the middle rack of the oven and bake for 35-45 minutes or until the chicken is cooked through and the cheese is browned on top.I love to use both mozzarella and feta in this dish. 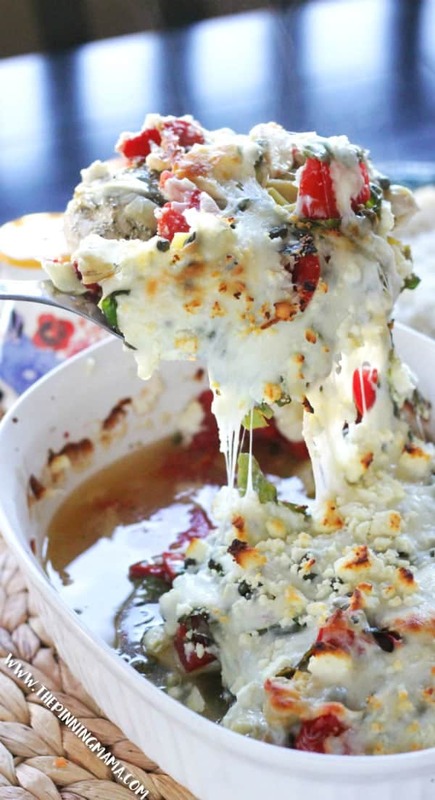 The mozzarella becomes more melted and really brings the dish together where the feta is tangy and compliments the Mediterranean flavors.Many people ask me on each chicken bake I post if you need to cover these. I bake mine on the middle rack in my oven and almost never need to cover them. I find that it helps the liquid cook out so the bake doesn’t end up soupy and perfectly browns the cheese. Now with that said, every oven cooks differently both from size, true temperature and even altitude, so when you make this, it would be smart to keep an eye on it and if the cheese appears to be overly browning, you can loosely cover with foil for the remainder of the cook time. On this chicken bake specifically, I would leave uncovered as long as possible because with all the fresh veggies there is still a bit of liquid in the bottom even with cooking uncovered. Serve hot over rice, pasta, mashed potatoes, or sautéed spinach. I like to serve these dishes in so many ways! The options are limitless. We even ate this a second time over quinoa and then I used the leftovers to chop up, mix with the quinoa and a little extra italian dressing and then ate as a cold salad for lunch. I hope you enjoy this recipe as much as we do! If you try it out I would love for you to let me know in the comments. It makes my day when people try and love my family recipes! Or you can tag me in a pic of your creation on instagram with @easyfamilyrecipes! Lay the chicken side by side in the bottom of a large baking dish, then sprinkle the greek seasoning evenly over the top of each piece of chicken. Layer on the chopped artichoke hearts, tomatoes, and spinach and then sprinkle the capers, lemon juice and olive oil over it. Top the dish with the mozzarella and feta cheeses and place on the middle rack of the oven and bake for 35-45 minutes or until the chicken is cooked through and the cheese is browned on top. Serve hot over rice, pasta, mashed potatoes, or sautéed spinach. There is a ton of liquid in the bottom of my pan after baking this. Is that normal? Its my second time making the dish and its been excellent. We like that its healthy and flavorful. Thank you for sharing. Can you make this recipe using frozen chicken breast? How many carbs are in this dish? I made this last night and it’s a KEEPER! So easy and delicious. We are an on the go family, so my main goals when looking for a new recipe are…. This hit all the criteria!! Great flavour, and seemed very gourmet with little effort, My husband kept saying……., you should take a picture of this one! , its beautiful….lol! ……. I didn’t but it looked just like the pics Kimber posted. I will definitely serve it for our dinner guests, now that my family have been the taste testers! One of my daughters is vegetarian, and I made her a cauliflower cheese bake at the same time, but I’m thinking that next time, I will substitute the chicken with cauliflower and make a little dish of this for her too. I made a few adjustments as didn’t have all the ingredients in house. I used garlic, thyme, paprika, rosemary and sage and liberal on the basil, since I didn’t have greek spice mix. I also used 300 gr frozen spinach, thawed in microwave and water squished out with fork, and I cut the breasts into 3 pieces each to make serving size. My oven runs hot, so cooked at 350 for 40 mins. Overall a success! Give it a try! Thanks, Kimber for posting it!! I made it as recommended except without capers bc I didn’t have any and used canned diced tomatoes…because I am lazy, I mean efficient :). I also prefer Konriko Greek Seasoning as it doesn’t have any msg and other crap.